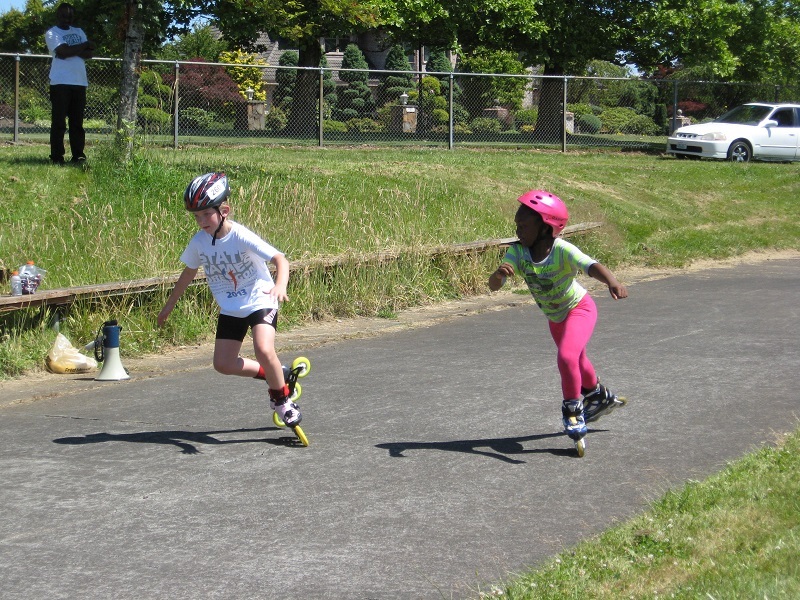 The banked track at Powell Valley School provides a great venue for skaters, on both inline and quad skates, to test their endurance as they skate a variety of distances around the track. Register ahead of time for peace of mind and less wait time during the competition. Entry Fee: $25 first two events. $4 each additional event. All speed skaters are required to wear a ANSI Z90.4 approved helmet for speed skating events. Elbow and knee protection is advised for outdoor events. Events with less than 4 entries will be combined by gender or by age. … if bullets rode on blades. Awarded to first, second and third places. Click below to see historical results. Michaela and Myla with their medals. Powell Valley School, Gresham Or. Gold: Kelsie Kershaw, Oregon City, Or. Silver: Jazmin Burkett, Springfield, Or. Gold: Mckenzie Stuart, Springfield, Or. Silver: Caitlin Richardson, Clackamas, Or. Bronze: Katie Pierce, Springfield, Or. Gold: Renee Koch, Portland, Or. Silver: Mary Ellen Reed, Portland, Or. Gold: Ryan Mckinnon, Clackamas, Or. Silver: Adelaide Holenstein, Happy Valley, Or. Bronze: Cecilia Welsh, Portland, Or. Gold: Emily MacKay, Portland, Or. Silver: Kelsey Kolibaba, Milwaukie, Or. Gold: Debbie Goodrich, Lake Oswego, Or. Silver: Bonny Smith, Vancouver, Wa. Bronze: David Warren, Troutdale, Or. Gold: Annie Mackay, Portland, Or. Silver: Susie Mackay, Portland, Or. Gold: Cecilia Welsh, Portland, Or. Gold: Caitlin Richardson, Clackamas, Or. Gold: Leslie Robinson, Portland, Or. Silver: Bill Duncan, Milwaukie, Or. Gold: Robert Marrella, Gresham, Or. Silver: Kit Duncan, Milwaukie, Or. Gold: Alyx Mowder, Springfield, Or. Silver: Annie Mackay, Portland, Or. Bronze: Susie Mackay, Portland, Or. Silver: Allyssa Burkett, Springfield, Or. Gold: Jazmin Burkett, Springfield, Or. Gold: Quincy Summerlin, Eugene, Or. Gold: Mitch Hall, Milwaukie, Or. Silver: Brandon Mowyer, Portland, Or. Oaks Amusement Park, Portland, Or. Gold: Chloe Toney, Eugene, Or. Bronze: McKenzie Stuart, Springfield, Or. 4th: Cecilia Welsh, Portland, Or. 5th: Emily Flippen, Springfield, Or. Gold: Wendy Haag, Junction City, Or. Silver: Sionna Stevens, Creswell, Or. Bronze: Jazmin Burkett, Springfield, Or. 4th: Tasha Flippen, Springfield, Or. Gold: Jennifer Hall, Happy Valley, Or. Gold: Kathy Reed, Gresham, Or. Bronze: Douglas Bechtel, Cornelius, Or. Gold: Cynthia Armstead, Tigard, Or. Silver: Emily Mackay, Portland, Or. Bronze: Polly Smith, Vancouver, Wa. 4th: David Warren, Troutdale, Or. 5th: Kit Duncan, Milwaukie, Or. 6th: Sheri Peterson, Portland, Or. 7th: Kelsey Kolibaba, Milwaukie, Or. 8th: Tiffani Burson, Clackamas, Or. Silver: Cecilia Welsh, Portland, Or. Gold: Paul McElhiney, Beaverton, Or. Silver: Spencer Swetnam, Boring, Or. Silver: Hannah Armstead, Tigard, Or. Bronze: Kit Duncan, Milwaukie, Or. Bronze: Bill Duncan, Milwaukie, Or. Gold: Sheri Peterson, Portland, Or. Silver: Douglas Bechtel, Cornelius, Or. Gold: Christina Spry, Cornelius, Or. Silver: Courtney Richardson, Clackamas, Or. Bronze: Hannah Armstead, Tigard, Or. 4th: Spencer Swetnam, Boring, Or. Gold: Agnes Stevenson, Aloha, Or. Gold: Hannah Armstead, Tigard, Or. Bronze: Kathleen Garre, Portland, Or. Silver: Tiffani Burson, Clackamas, Or. Gold: Spencer Swetnam, Boring, Or. Silver: Christina Spry, Cornelius, Or. Bronze: Courtney Richardson, Clackamas, Or. Silver: Susie McElhiney, Beaverton, Or. 5th: Robert Sitton, Portland, Or. Gold: Kathleen Garre, Portland, Or. Bronze: Christina Spry, Cornelius, Or. 4th: Shachar Kakaun, Portland, Or. 5th: Tyler Smith, Salem, Or.